We have a small bake house to the rear of our barn, that we decided to use as a training school and hopefully make our mistakes on a small scale before taking on the main barn conversion. We wish to run our main electric cable underground from the pole with our temporary 6kw supply to the barn's planned utility room (a run of 40 metres) and then underground to the bake house (another 50 meters). I think I know about the requirements for trench depth - 500mm deep, with sand bed, red ducting, more sand and webbing, then back fill. However, I would appreciate some help with cable size and type (our supply will be single phase). We plan to use a wet underfloor heating system for our heating in the main barn and the same system combined with immersion heater for the hot water in three bath/shower rooms, plus the normal domestic requirements of a large three bed property. The bake house has converted into a small one bedroom house on three floors (immersion heater for hot water, wood burner plus electric oil filled radiators for heating and the usual domestic demands. There is an easy to use calculette on the Volta site. 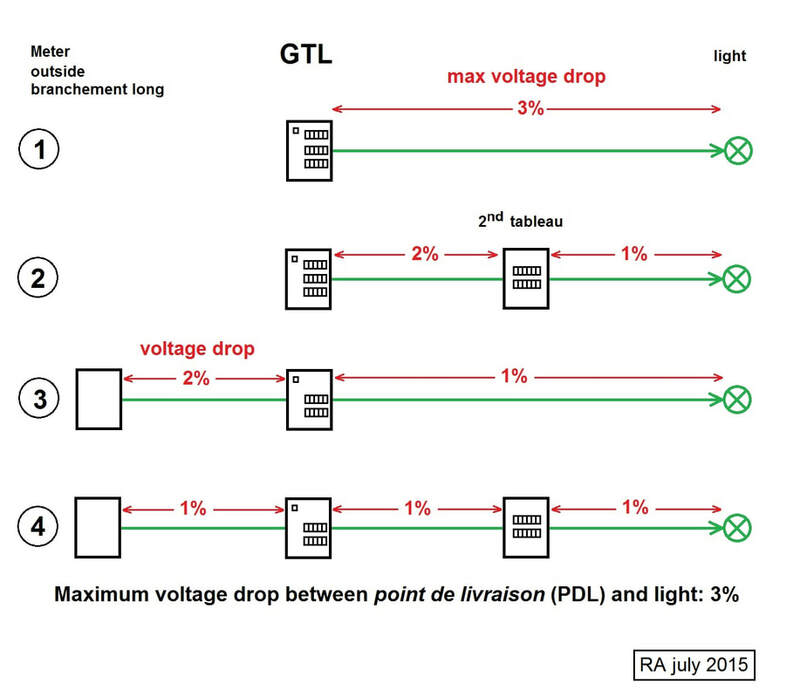 There are new regulations for the maximum voltage drop from the EDF reseau to the client, the recently revised NF C 14-100 code. A brochure of the UTE explains this. Page 27 will give you an impression of the connection between powergrid and the consumerbox. Not more than 2 % voltage drop (chute de tension) under nominal load conditions. Fifty centimeters deep is o.k., but almost twice as deep where you have to cross a road or path for cars. To continue my short answer of last night I would like to make a few additional remarks. Short again, because my classic analogue modem connection here in France suffers from frequent time-outs and disconnects. You mention a temporary 6 kVA supply. Is this a branchement de chantier, for 6 months or one year, with your installation électrique waiting for the green light of Consuel to get your final connection to the EDF powergrid? Or do you consider an already existing abonnement to be underpowered for what you intend to connect in the (near) future? And go for a another puissance souscrite of e.g. 9 kVA or 12 kVA monophasé? And although you could use the calculator on the Volta site using the corresponding current in amps for the rather common connections of 6 kVA, 9 kVA and 12 kVA (30, 45 and 60 A), it would be a good thing to see more precisely how much power you think you're going to use in the different buildings. From the pole to utility room of the barn: use the calculator with the current of your future abonnement souscrite and the run of 40 meters. From the barn to the smaller bake house: a standard solution in France is to use a smaller tableau électrique secondair, feeding it from the main consumer box with a disjoncteur of 32 Amps. In a brochure of Leroymerlin this has been described as a tableau supplémentaire. See also the links to other French documentation for more details. Inside this smaller consumer box: to start a interrupteur differentiel, feeding say 3 disjoncteurs for éclairage, prises and a chauffe-eau. Use the calculator with 50 meters and a current of 32 A. A lot of earlier links seem to live in dead end street today. So to make sure that you get what you're looking for I've tried to get several essential cable sizes in a more or less readable layout. From your main breaker, disjoncteur de branchement (DB), to your consumer unit, tableau de répartition principal. Included: cable sizes in the consumer unit. Or try this French website: the answer is only a few mouse clicks away. 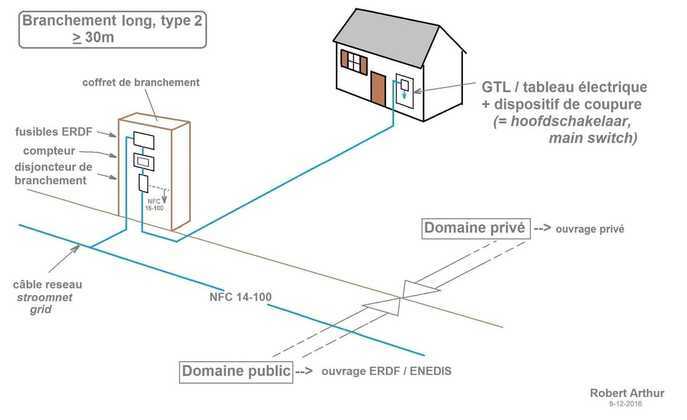 The introduction in the French NFC 14-100 code is still on the internet, after some searching, although not on the UTE website anymore. Have a look at the Type 1 and Type 2 installations. Look what they have to say in French, but with crystal clear pictures. Starting point: Branchement à puissance limitée de type 1. Or see how the ERDF is explaining these issues in understandable language. And, no surprise, there is also a document of Promotelec. Many years ago, so time for an update. For the long connection - more than 30 meters - and copper wiring these are the wiring lengths for a voltage drop of 2 %. For aluminium, lower price but not always easy to handle, this table will give you the answers for single-phase and three-phase. In some cases a voltage drop of 2 % can be too much, see this diagram. Use one of the many internet tools (calculettes) to calculate the exact voltage drops to be expected. 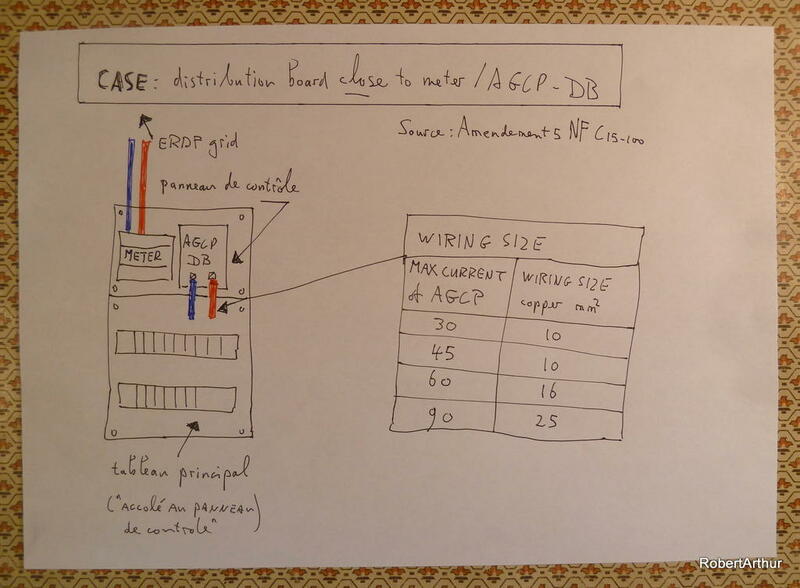 For the short connection, meter and consumer unit on the same board, the diagram is rather simple.